For over 100 years Sturm Elevator has been installing and servicing residential elevators throughout the state of Oregon. With over a century of experience, Sturm Elevator is the number one choice for residential elevator installation in Lincoln City, Oregon. Sturm has been a family owned and operated company since the beginning and our customer service reflects that. We treat each and every customer as a member of the family and respect every home as our own, striving to exceed expectations. There can be many reasons for wanting a home elevator, whether it be safety or convenience, adding luxury or increasing value, Sturm Elevator is the home elevator installer in Lincoln City, OR you can count on to complete an install correctly. You can expect, and we’ll always deliver, excellent quality and value. If you would you like to learn more about residential elevator installation in your Lincoln City, OR home or other services such as service, maintenance, upgrades and modernization of an existing home elevator, then call Sturm Elevator today at 503-284-2003 for a free consultation and estimate. Some of the top features and benefits offered by Sturm Elevator for your Lincoln City home elevator installation are mobility, ease of movement and safety. Staircases in older homes can sometimes present a real challenge for homeowners, especially when the pitch and steepness are less than ideal. Making a steep staircase safer, making it more convenient to access levels above and below the ground floor and improving the freedom of movement within your home can all be accomplished by installing a residential elevator from Sturm Elevator. Adding a residential elevator to your Lincoln City, Oregon home will not only create freedom of movement within the house, but it can potentially increase the overall value as well. You have made a large investment in your home and you are ready to increase the value, a home elevator that compliments the home could accomplish just that. But much like a non-operating and forgotten pool, a non-functioning and neglected home elevator could quickly scare away a potential home buyer or have them negotiating a much lower price then you’re hoping to get. Contact Sturm Elevator. We offer elevator models that operate quietly and with peak energy efficiency. So, enjoy the luxury of a modern home elevator and increase the value of your home. To learn more about all the mobility solutions that Sturm Elevator offers senior citizens, click here for our Elder Care page. On the Elder Care page, you will find many options including the installation of a home elevator to help seniors maintain a safe and maneuverable home that they can enjoy for more years to come. Nothing says luxury quite like a home elevator. There are many customizable options offered by Sturm Elevator, and we’re certain you will find something that elegantly compliments your home. The design opportunities are endless, with customizable options from inner and outer doors, fixtures, railings, flooring and even the control panels. We’re confident that our luxurious home elevators are something you’d love to have in your home. If you would like to take a more detailed look into the residential elevator options and installation types that Sturm Elevator has to offer, then click here for our main Residential Elevator installation page. Everything from the type of elevator to the manufactures and customizable specification can be reviewed in further detail. In the likely case that you have any questions or concerns, call Sturm Elevator at 503-284-2003 and get a free consultation and estimate. If you’re short on time and would prefer Sturm to call you, then fill out the online contact form below and a member of our team will contact you. Installing a residential home elevator isn’t the only service Sturm offers, we also offer regular service, repair and maintenance for existing residential elevators in the Lincoln City area. The highly knowledgeable and professional technicians can keep your home elevator in pristine condition, while offering available 24 hour, 7 days a week emergency elevator service. So, in an emergency or unexpected breakdown please call Sturm Elevator team at 503-284-2003. In some cases, a home elevator isn’t the right option, but a mobility problem must be resolved for a loved one. 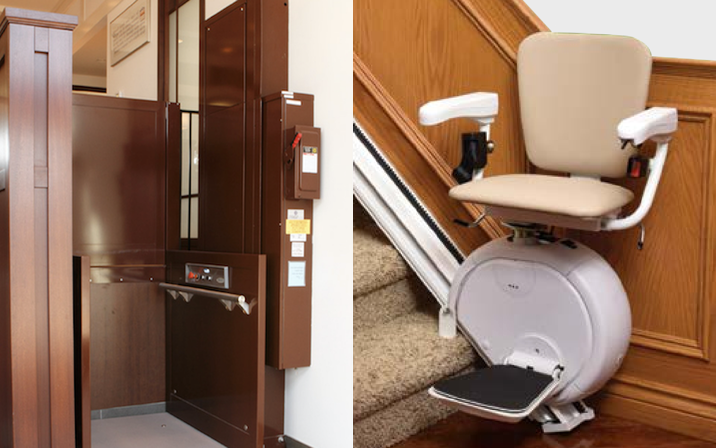 Talk to Sturm Elevator about residential stair lift installation or residential wheelchair lift installation. These could be a wonderful alternative, especially for those who rely on a wheelchair or another mobility device. 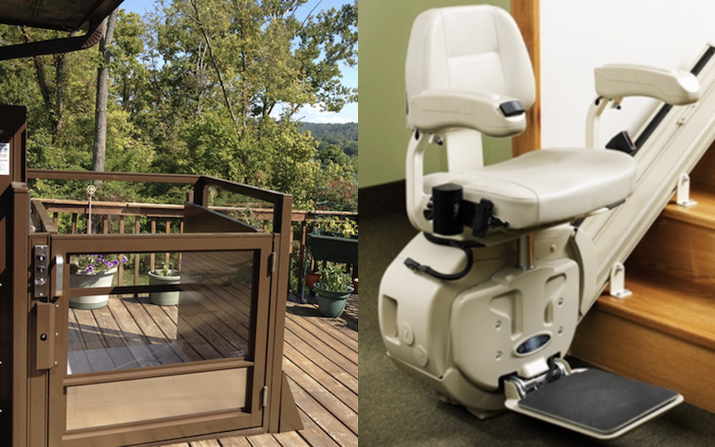 A residential chair lift would allow one to travel up and down levels in their wheelchair or scooter with ease (click here to learn more about home chairlifts). A residential stair lift could be a much more reasonable and affordable option for those who need assistance moving up and down stairs (for more information on home stairlifts click here). A home elevator may be impractical in some cases and a home stair lift is a much simpler install. The tracks can also be extended beyond the top and bottom of a staircase for more convenience and ease of movement. Lincoln City, Oregon homeowners call Sturm Elevator today to learn more about our home mobility solutions like residential elevator installation, residential chairlift installs, residential stairlift installs and more.